There's nothing worse than being the only kid in your class who's never been to Disneyland -- except for discovering that finally going to Disneyland actually made you a fart-muncher, because all the cool kids go to Disney World. Don't make your dog be that kid: take him to Zoom Room. Offering extensive owner/dog activities and professional training, Zoom's a mammoth center of canine kicks and learning designed to turn your hound into a hyper-athletic, trick-performing, socially adapted ultimate party animal (Zoom Room: from duds to Spuds since 2010). 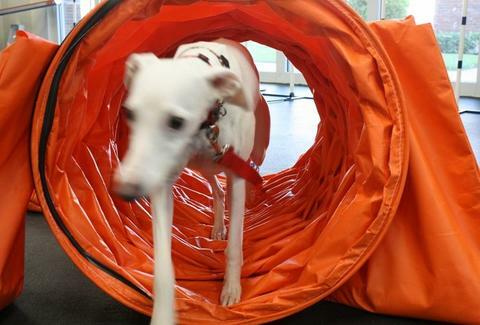 On the physical front, agility work's centered around an obstacle course (teeter-totter, jumps, tunnels, etc) that also has mutts competing in league play; then there's core-building "Pup-lates" (utilizes equipment found in human gyms), plus fun-for-Fido classes from Scent Tracking (teach your dog to find stuff, even your cell phone) to Retriever Training ("Fetch me a beer! class"), and trick-development from mid-air flips to skateboarding -- so now he won't stop slobbering, or listening to Fall Out Boy. Psychologically, shy dogs are taught to overcome "fear and anxiety", while outgoing mutts can take distance-control and hand-signal focused Hollywood Dog Training, which result in a referral to "a respected local animal acting agency", in turn leading to your dog to file for emancipation like MacCollie Culkin. The good times apex is the Canine Social Club, where dogs can get together for anything from a "Bark Mitzvah" to the mirrorball'd, laser-light-show equipped Doggie Disco ("expect hilarity"). There's also human-singles-friendly "Hound Lounge", where "you'll meet great people; your dog will meet great dogs" -- because there's nothing worse than owning a four-legged babe magnet, and still having the Magic Kingdom be Never Never Land.